Most people have heard of Marie Curie, a scientist known for her work with radioactivity, and the first woman to win a Nobel Prize. She and her husband Pierre Curie discovered radium, a decay product of uranium, in 1898. Two years later, German scientist Freidrich Ernst Dorn discovered a gaseous decay product emanating from radium, which he creatively referred to as “radium emanation”. In 1908, English scientists William Ramsey and Robert Whytlaw-Gray worked with radium emanation and found that it was the heaviest known gas. They called it “niton”, from the Greek word for “shining”. 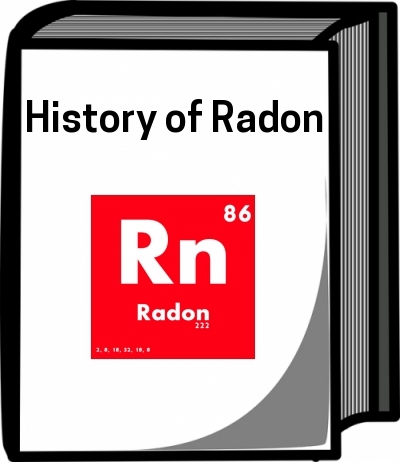 The final term “radon” has been used to refer to the element since 1923. The first indication that radon might play a part in lung cancer came from uranium miners. These miners were developing lung cancer at higher-than-average rates. After many studies accounting for other variables, it became clear that the cause was the radon they were exposed to in the mines. After radon had been linked to cancer, there was little initial concern for anyone who did not work in mines. This changed when Stanley Watras, who worked at a nuclear power plant in Pennsylvania, set off the alarm on a radiation monitor. One might think that this would be an obvious indication of nuclear radiation, but Watras was working on the construction of the plant, and there was no nuclear fuel present at the time. After investigation at Watras’s home, it was discovered that radiation was present at levels of 2,700 pCi/L (picocuries per liter). Ultimately, radon was found to be the source of the radiation. For reference, the current recommended level at which action should be taken to lower radon levels is set at 4pCi/L by the US EPA, meaning Watras’s home had almost 700 times the “safe” level of radon. This event launched further study into residential radon, which eventually spurred the creation of the Radon Gas and Indoor Air Quality Research Act of 1986. With our current understanding of radon, we know that it is the second leading cause of lung cancer (second only to smoking), and the first leading cause in nonsmokers. Cigarette smoke and radon work synergistically to have a greater increase on lung cancer risk than just the combination of each individual risk, so radon poses a great threat to smokers. Radon is responsible for an estimated 21,000 lung cancer deaths in the US each year. There are multiple faces of radon, people affected by radon-induced lung cancer who have made it their mission to spread awareness of the dangerous carcinogen. One “face of radon” was Elizabeth (Liz) Hoffmann, founder and first president of Cancer Survivors Against Radon (CanSAR), a never-smoker diagnosed with lung cancer at age 37. Liz succumbed to the disease after a 10-year fight during which she testified before Congress and several state legislatures, raising radon awareness and resulting in radon remaining in the EPA budget. Her appearances also helped to get awareness bills passed in Illinois and Minnesota. Another “face of radon” is current CanSAR president Rachael Malmberg, an athlete and never-smoker diagnosed with lung cancer at age 32. She is an outspoken advocate for radon testing, and her story has been featured on FOX and other news outlets.